Cancer is a leading cause of death in developed countries. In this webcast Dr. Andreas Scherer will explain how personalized medicine can transform our approach to fighting this disease. He will also discuss current roadblocks and diagnostic challenges, and the pivotal role of Next Gen Sequencing to overcome these challenges. The webcast will inform about best practices to design and implement a cancer testing pipeline: from sample preparation, to sequencing, to secondary and tertiary analysis of sequencing data. The goal is to rapidly identify clinically actionable data that allows an oncologist to quickly determine the best available treatment options. 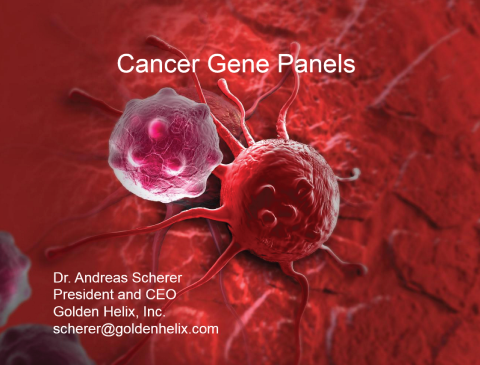 The webcast will include demonstrations of the Golden Helix VarSeq software in the context of analyzing cancer gene panels and somatic mutations.